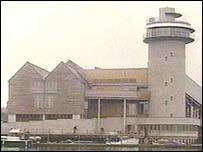 The National Maritime Museum in Falmouth has won an award for its architecture. The annual Royal Institute of British Architecture Awards (RIBA) were announced on Thursday and the museum is one of only two buildings in the South West to receive the accolade. The RIBA awards are considered by people in the industry to be Oscars of the architectural world. They are given to buildings with an excellent design quality and which contribute positively to the local environment. Commenting on the Falmouth Maritime Project, the RIBA jury chairman, Anthony McGuirk, said the museum sits in Falmouth as if it "had always been there". "It demonstrates architecture at its very best," he said. The museum, opened by the Duke of York in March, now goes forward with the Theatre Royal's TR2 building in Plymouth to be judged for one of seven national awards and eventually the overall RIBA Stirling Prize.